The theme for the Saturday Tea class this week at Grace-Marie’s Kitchen at Bristol Farms in Manhattan Beach was Back to School Autumn Tea. This week the menu was Autumn Harvest Brandy Pear Cake, Apple and Cheddar Bread, Autumn Berry Tapioca Parfaits, Caramelized Onion and Brie Croissants, End of Summer Zucchini Soup and Smoked Salmon Tomato Cups. This is Part Two with the second two recipes from that class. 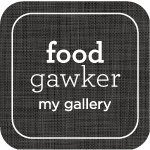 I want to post about all of the recipes because every one was wonderful. Just for your information, the new class schedule just came out that goes through January 25, 2011. Oh my gosh, time is just spinning along, isn’t it. If you click over to the new class schedule on the Bristol Farms website, you will also notice that you can have your special event at Grace-Marie’s Kitchen. You can have tailor-made classes for Birthdays, Weddings, or Baby showers, Anniversaries, Office Parties and Homeschooling. Grace-Marie would help make your event so much fun, and of course, the food would be great. 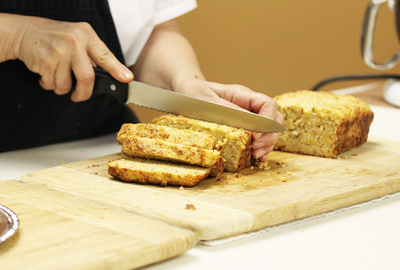 Here you can see Grace-Marie cutting the Apple and Cheddar Bread she made for us. This bread was moist and a little sweet from the apple and cheesy from the Cheddar. There was a Holiday note from the minced sage and I can imagine this bread toasted, grilled or sautéed in a little butter. It has a marvelous texture and I ate mine for breakfast, lunch and dinner. Yum. 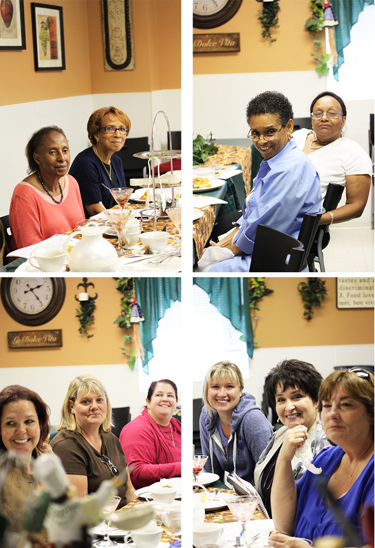 Here are the wonderful ladies who came to tea. I know they had a good time, because they were talking and laughing a lot. And eating and drinking tea! 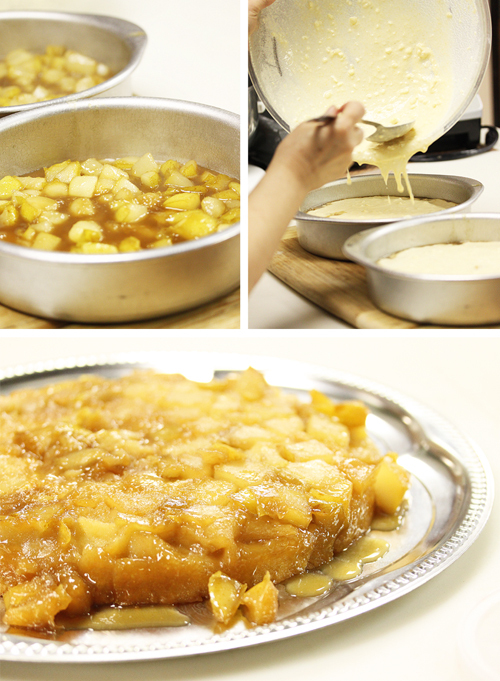 Next Grace-Marie demonstrated how to make the Autumn Harvest Brandy Pear Cake. 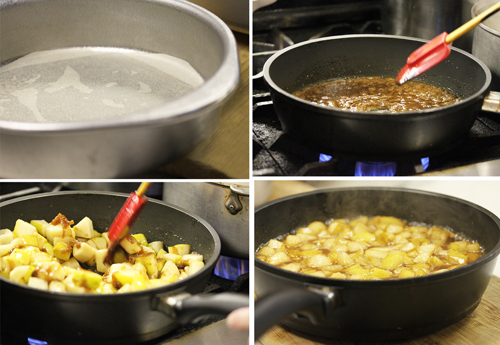 First the pears were sautéed in butter and brown sugar, and then poured into a parchment lined pan. The cake batter was made and poured over the pears and baked for about 30 minutes. It was cooled for 10 minutes and inverted onto a serving platter. This cake has a really nice texture from the addition of a little cornmeal. And what is better than a moist, caramelized pear-covered cake with a big dollop of whipped cream. I think I’m making this for my Christmas dinner buffet! 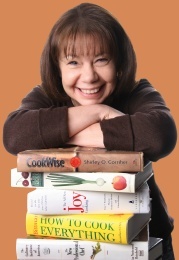 I usually use a moist apple like a Golden Delicious or Gala – tip … shredding the apple in the food processor by pulsing usually releases more juice, which should also be included in the batter. This is a very thick batter. When it is transferred to the baking pan it should be leveled off and tapped on the counter to release air bubbles – that helps a bit too! Also, as with all quick breads, it is really important not to cut the loaf until completely cool. 1. Preheat oven to 350 degrees F. Coat a 9” loaf pan with looking spray. Insert parchment paper overlapping over the long sides. 2. Combine and mix the flour, baking powder and salt. Set aside. 3. Using an electric mixer, beat the butter, sugar and eggs until light and fluffy. By hand, mix in the flour mixture. Fold in the apples, cheese and sage. Spread batter into prepared pan. 4. Bake until risen and a wooden skewer comes out of the center clean (45+ minutes). Cool to room temperature before slicing. Slice the bread, place it in a basket and serve with the butter! Optional – Add 1 cup toasted chopped walnuts. 1. Preheat oven to 350 degrees F. Coat a 9” deep pie pan with cooking spray. Place a round portion of parchment paper onto the bottom of the pan. 2. Warm the butter and brown sugar in a skillet over medium heat. Add the pears and sauté just until tender (5 minutes or less). Remove the skillet from the heat, stir in the brandy, return the skillet to the heat and cook, stirring, for another minute (be careful as it may flame up). 3. Pour pear mixture into prepared pie pan. 1. Using a food processor, combine the flour, sugar, cornmeal, baking powder and salt. Scatter the butter over the top of flour and pulse until crumbly like uncooked oatmeal. Transfer to a bowl. 2. Combine milk, egg and brandy. Mix into flour mixture just until blended. Spread over the pears in the pie pan. 3. Bake until risen, light golden and a wooden skewer comes out of the center cleanly (30 minutes). Cool for 10 minutes, then invert onto a serving platter. Cool completely. Cut into wedges and serve with garnish. Note: Recipe can be made into 8 muffin cups. Baking time reduces to approximately 20 minutes. Both of these would be fantastic to serve at a get together. I think I might make that apple cheddar bread for a hostess gift. What a lovely group of ladies! And what lovely recipes to go along with those photographs. I get so giddy during Fall because apples are my favorite piece of produce to bake with. These are two more recipes that I’m adding to my list! Oh my goodness! These look awesome. Can hardly wait to try. Especially that upscaled upside-down cake. Yum! The pear cake looks amazing, incredible as for the bread I can’t seem to stop thinking what an incredible Turkey Stuffing it would make for Thanksgiving, I’m Sorry and Tell Grace Marie that I am Sorry. That cake is making me hungry. Not to mention, your bread looks delicious. The apple bread looks so tasty and moist. Sure I have all the ingredients in stock and more than enough fallers. Time to get into the kitchen! the apple cheddar bread looks incredibly good. we’ve been looking for a recipe to introduce ourselves to the apple/cheddar combination. think this is it! This both look fantastic, but the pear cake has really caught my eye! A friend brought me some pears from a tree in her yard and I am anxiously awaiting their ripening!!! But the bread looks fast and easy… Oh what to do??? Grace Marie is a source of wonderful recipes! thanx! O.M.G. It all looks incredible, but the apple cheese bread…there are no words! I am really enjoying these posts (heck, I like all your posts!!) but I love this type of food!! I am definitely going to try the bread – I think using the fresh apple would be key – a perfect aperitif!!! 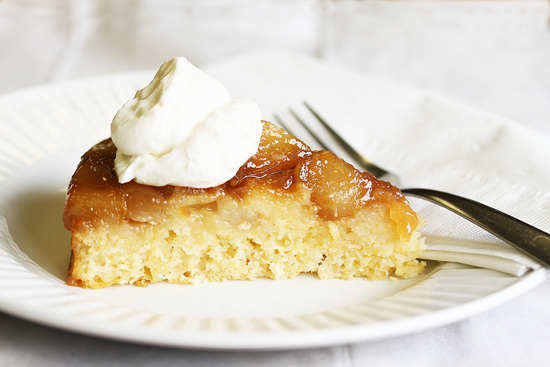 As for the pear cake – that is my kind of dessert so I will be making that one as well – perfect for the holidays!! Just wanted to gently and lovingly point out that the recipe for the apple cheddar bread is missing the instructions for incorporating the apple, cheddar and sage. I figured it out, but others might appreciate it too! 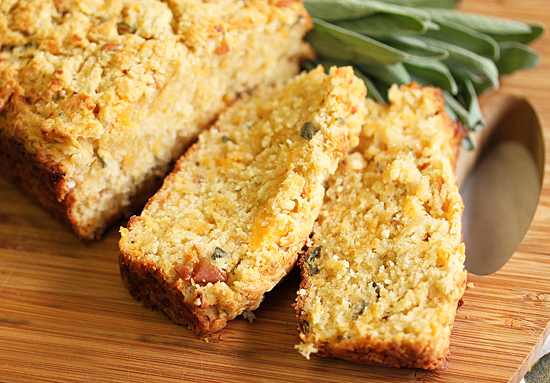 The Apple and Cheddar Bread recipe is what caught my attention and pulled me into your blog. 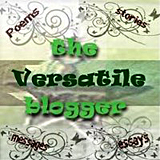 But I’ve got to say your enthusiasm, creativity have kept me reading! Thanks for the inspiration…and the Apple and Cheddar recipe that we’ll be sharing with our cheddar fans.